I've found myself making a lot of biscotti lately. I just can't seem to sit down with a cup of coffee without wanting something small and sweet to snack on and biscotti are the perfect way for me to fix this problem. They are easy to make, usually make a large batch, and can be shaped into whatever size you might want. For the last couple of rounds of biscotti making I've been playing around with different variations on this recipe from King Arthur Flour. They call it American style biscotti because it is not quite as rock hard as some of the traditional Italian biscotti recipes. These cookies bake up crisp and light, crunchy without being teeth shattering. I think they have the perfect balance of crunchy sweetness to go alongside my cup of afternoon coffee. And the great thing about biscotti is they last for several weeks in an airtight container on you counter or in the cupboard. That means not having to worry about running out anytime soon or having them go bad. It is the perfect way to ensure you always have a sweet treat around for snacking on for those moments when you just need a little something to get yourself through the afternoon. These cookies are wonderful just straight up and plain, but for this batch I decided to go with a little drizzle of chocolate for a little added visual interests and of course to boost the flavor up just one more notch. This is a great recipe to use as a starting point for any number of wonderful combinations you might want to try. I've made several other batches that might make an appearance on the blog in the future. Really any dried fruit, any type of chocolate, or any nut/seed would make a wonderful add in. You can't go wrong so let your imagination go wild and give this recipe try. 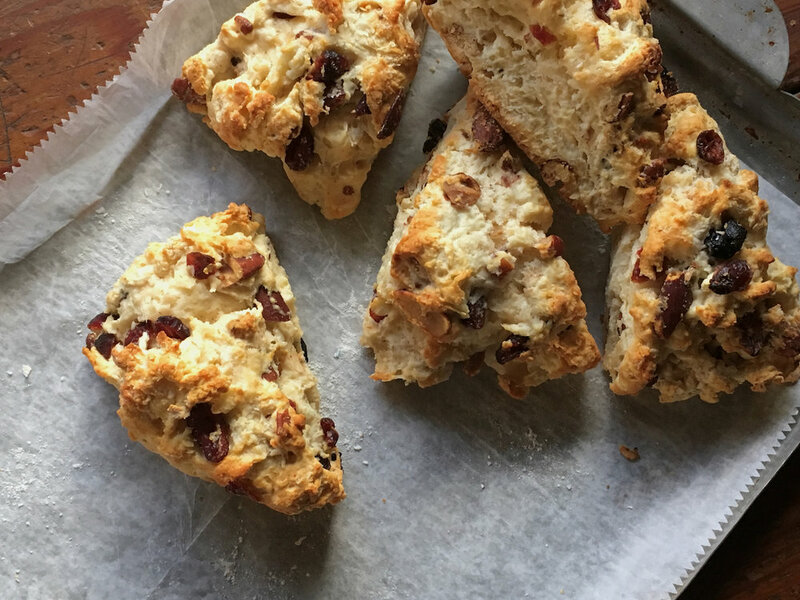 It's time for another biscotti recipe. One of my favorite baked goods to make. I love the transformation from long, flat log of dough, into cute, crunchy little cookies. It amazes me every time. I also love how long they last in an airtight container in my cupboard. This is one of the few baked goods I make that I don't freeze right away. Because they are completely dried out they don't really go stale or lose their texture, at least not very fast anyway. This chocolate cocoa nib biscotti turned out perfectly. I decided to add a few cocoa nibs to the dough and I loved the combination with the chocolate chips. The cocoa nibs add a different flavor and texture to the cookie that really help them stand out. A hint of espresso powder in the dough complements the chocolate and brings all the flavors together into a perfectly balanced treat. Don't worry if you don't have any cocoa nibs, the biscotti will still be wonderful without them, but if you happen to have some on hand I highly suggest the addition. The same with the espresso powder. You can really add whatever flavors you have on hand. Be creative and do what you like. Don't have espresso powder, how about some cinnamon instead, for that chocolate-spice mix? Have an orange lying in your fridge? Zest it up and throw it in for a wonderful chocolate orange combo. How about swapping out some or all of the chocolate for some dried fruit, or some chopped nuts, or both! Let your imagination go wild! In a small bowl, whisk together the flours, baking powder, salt and espresso, set aside. In the bowl of a stand mixer fitted with the paddle attachment beat together the butter and sugar until light and fluffy. Add in the eggs, one at a time followed by the vanilla, mixing well after each addition. Add the dry ingredients to the butter mixer in two parts, mixing until just combined after each addition. Mix in the the chocolate chips and cocoa nibs, if using. Split the dough in half, and shape each half into a long log, about 1 1/2 inches wide on a parchment paper lined baking sheet, leaving a little room between each log. Sprinkle the top of each log with turbinado sugar. After the 30 minutes, slice the biscotti to your desired thickness (I got about 25 cookies) and arrange the slices on the parchment lined baking sheet. Bake for an additional 35-45 minutes, until biscotti are completely dried through. Cool on a wire rack and then store in an airtight container. Sitting down on a lazy afternoon with a cup of coffee doesn't feel complete without a little sweet treat to go along with it. Biscotti is one of my favorite coffee time snacks. It's fun to make, and it lasts forever in an airtight container. I've tried many different biscotti recipes over the last several years, some are better than others, but none have been bad. This one ranks near the top of the list. What I really like about it is the addition of a little cornmeal to the dough. This cornmeal adds just enough crunch to make things interesting, it just livens the cookie right up! The almonds also add to the crunch factor, a perfect combination. I actually made this recipe twice in less than a week the first time I made it, it was that good. And it will definitely be a regular in the coffee time cookie rotation from now on! The original recipe is for almond anise biscotti, but I'm not a huge fan of anise flavor. I just omitted it and added in a little almond extract to amp up that almond flavoring instead. It turned out great! I love crunchy, almond-y, buttery cookies, especially with a delicious cup of coffee! Preheat the oven to 375 F. Line a large baking sheet with parchment paper; set aside. Spread the almonds in a single layer on a rimmed baking sheet. Toast in the oven until fragant and just beginning to turn light golden, 6 to 8 minutes. Transfer nuts to a clean surface; spread evenly, and let cool completely. Sift together flour, cornmeal, baking powder, and salt into a medium bowl; set aside. In the bowl of an electric mixer fitted with the paddle attachment, beat the butter and granulated sugar on medium-high speed until light and fluffy, about 3 minutes. Beat in the vanilla and almond extracts. Add 3 eggs, one at a time, beating to incorporate after each addition and scraping down the sides of the bowl as needed. Add the flour mixture, and beat on low speed until combined. Mix in toasted almonds. Turn out the dough onto a lightly floured surface and knead to evenly distribute the nuts. Divide in half. Shape each piece into a 18-inch log, and transfer to the prepared baking sheet, about 3 inches apart (note: this biscotti does not spread a lot during the first bake, so shape accordingly). Brush beaten egg over the surface of the logs, and sprinkle generously with sugar, if using. Bake, rotating pan halfway through, until logs are lightly browned and firm to the touch, about 25-30 minutes. Transfer parchment and logs to a wire rack to cool slightly, about 20 minutes. Reduce oven temperature to 300 degrees. Place logs on a cutting board. Using a serrated knife, cut the logs crosswise on the diagonal into 1/2-inch-thick slices. Place a wire rack on a rimmed baking sheet. Arrange slices cut side down on the rack. Bake until firm to the touch, about 30 minutes. Remove pan from oven; let biscotti cool completely on the rack. Store in an airtight container. Anyone that knows me well knows that I love going out for coffee. Sitting at a warm, cozy coffee shop with a comforting cup of coffee, talking with family members or friends about nothing at all is so relaxing and enjoyable. Most of the time I just stick with my mug of coffee and call it good, but I have to admit, I always want something to go with it. A muffin, a pastry, a chocolate chip cookie, anything at all really. It's so nice to have something sweet to balance out that cup of coffee. Biscotti is another great option that sometimes fits the bill perfectly. Crunchy, slightly sweet and just the right size. It's also fun to make at home, pretty easy to throw together and lasts forever in the cupboard because it is dried out to begin with. This chocolate espresso biscotti is one of my favorites, and it really is the perfect companion to your morning coffee. I've made a few different biscotti recipes now, and this one is pretty close to the top. The texture is perfect, it's crunchy, but not so hard that you feel like you are going to crack your teeth on it. I love the slightly bitter espresso flavor that is balanced out by the bittersweet chocolate, it's a perfect combination. Preheat the oven to 325ºF and line 1 sheet pan with parchment paper. In a small bowl, dissolve the instant espresso powder with 1 tablespoon hot water. Set aside. In a medium bowl, sift together the flours, baking powder, and salt. Set aside. In an electric mixer fitted with a paddle attachment, cream the butter and sugar until light and fluffy, about 4-5 minutes. Mix in the eggs, one at a time. Mix in the espresso flavoring and vanilla extract. With the mixer on low, add in the flour mixture and mix until just combined. Mix in the chocolate chips until just incorporated. Divide the dough into 3 equal portions and form each portion into a log (~1 1/2 inches thick). Do not flatten the logs (the dough will be sticky). Place the logs onto the sheet pan, a few inches apart from each other. Bake until golden brown, about 30 minutes. Remove from the oven and let cool slightly. Turn the oven down to 275ºF. Transfer logs to a clean cutting board. Using a serrated knife, slice the logs diagonally, 1/2 inch thick. Discard the end pieces (or munch on them like I did). Place the cookies cut side down on the sheet pan and bake for another 45 minutes, until toasted and dry. I've posted a couple of different madeleine recipes on this blog so far, and they've all been good, but this recipe takes the cake, literally! I was looking for a simple recipe that wouldn't take too long to make, that I could snack on with my coffee. After browsing through a handful of recipes I decided on this one due to the additions of brown sugar and honey, as well as plenty of melted butter. And let me tell you, the butter definitely shines through. These madeleines were so light and buttery, with just the right amount of sweetness from the three different kinds of sugar. One little cake is perfect for me to satisfy my cake craving for the afternoon, and the perfect accompaniment to a cup of coffee. The batter for these madeleines whips up in just a few minutes. The batter does need to rest in the fridge for at least 30 minutes, but that's not too bad. By the time you're done cleaning up and getting your coffee ready you can pop these puppies into the oven and have freshly baked mini cakes in just a few minutes. That's the beauty about madeleines, you get to eat cake without feeling guilty because they are so small and light. The batter can stay in the fridge for up to 2 days as well, so you can mix it up in advance if needed. Very versatile, and very yummy! In a medium bowl, whisk together the eggs and sugars until smooth. Whisk in the dry ingredients, followed by the vanilla. Gently whisk in the melted butter, and finally, the honey. You'll have a thick, smooth, shiny batter. Press a piece of plastic wrap against the surface of the batter and refrigerate for at least 30 minutes or up to 2 days. Center a rack in the oven and preheat the oven to 425 degrees F. Generously butter madeleine pan, dust the insides with flour and tap out the excess. Fill each madeleine mold with about a teaspoon of batter; the molds should be about three-quarters full. Don't worry about leveling the batter--it will do it by itself in the oven. Bake the cookies for 8 to 10 minutes, or until they are puffed and golden brown around the edges. Remove the pan from the oven and either serve the madeleines immediately or put them on a rack to cool. Repeat with any remaining batter, making certain to cool and rebutter and flour or respray the pan(s). Just before serving, dust the madeleines with confectioner's sugar. Makes around 18-20 madeleines. I've never actually bought the cranberry bliss bars from Starbucks, but every single time I see them I want to try them. They are just so pretty, and look so tasty, but I never want to shell out the money to buy a tiny little bar, especially when I can probably make them at home! I've had this recipe for cranberry bliss bars in my recipe folder for quite some time, but it took me forever to get around to making them. The recipe calls for cream cheese, dried cranberries, and white chocolate, and I never seemed to have all three of those at the same time. Finally, over this past Christmas break I decided I had to do it, so I went out and bought these three ingredients so I would no longer have any excuses not to make these bars. I'm glad I finally did it. I thought these bars were fantastic. The blondie base layer is buttery and chewy, and filled with white chocolate and cranberries. Topped with a white chocolate cream cheese frosting, covered in more cranberries and drizzled with more white chocolate, they are absolutely delicious. I still haven't tried the real thing from Starbucks so I can't compare them, but I really don't feel like I have to! Like I said, the blondie is delicious, and could probably work as the base for some other bars. I'll have to play around with that a little. They're not difficult at all to throw together, I love anything with melted butter because I can still make it right away, even if I forgot to soften the butter. So if you are craving coffee shop pastries at home, take the initiative and make your own, it's worth it! Preheat the oven to 350 degrees. Spray a 9×13-inch baking dish with nonstick spray or line with parchment paper.